"an extraordinary fence covered in thousands of locked padlocks, running alongside a footpath. [Their Cologne guide says:] 'It was a craze that began two years ago. Nobody knows why. People lock a padlock and throw the key in the water, so that love will last - like the lock.'" The book came out in 2011, and this phenomenon, not elaborated upon, apparently dates back to a century ago, in Serbia in the First World War. However, it has gathered incredible popularity in less than a decade, thanks, it seems, to an Italian book and film of 2006 and 2007. It's something I've observed in continental Europe in recent years, in Paris, where it brought down a parapet of the Pont Des Arts bridge, in St Petersburg, in Hamburg, and now in Stockholm. Here I saw a few locks on the fence around the view point at Monteliusvägen. As the tradition dictates, the lovers affix the padlock, then throw the key into the water: from Monteliusvägen, one would need a superhuman throw to land the key in the Riddarfjärden. Perhaps the keys just dropped onto cars on Torkel Knutssonsgatan. As described in the 1870 Baedeker The Rhine and Northern Germany, the train arrives 'suddenly' into the Wupper valley. On the left hand side of the train at Varresbeck, the Schwebebahn is seen. This caused some interest among other passengers - on both sides of the train - looking out of the windows to see, and for much of the remaining distance, the train runs parallel to the Schwebebahn to Wuppertal Hauptbahnhof. Wuppertal was, in the 19th century, a populous and built up area. It was limited by its geography: the Wupper valley is narrow with steep sides, which controlled the expansion of the towns along its length which make it up; other nearby conurbations in the Rhine-Ruhr area were better able to expand, especially in industrial capacity. 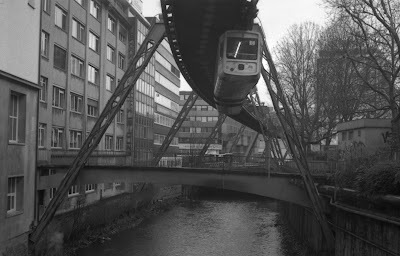 The unique Schwebebahn ('floating' or 'hovering railway') was opened in 1901. The system was designed by Eugen Langen to sell to Berlin. For much of its length it is suspended above the Wupper river itself: in an already built up area, finding the space to construct a light rail system would have been difficult, as the geology would also make tunnelling for an underground metro prohibitively expensive. The Schwebebahn makes use of the open space over the river, and then departs from the river's course at the western end from Sonnborner Strasse to Vohwinkel. From one end at Oberbarmen, to Vohwinkel, the journey takes about half an hour, and the trains are regular, when I was in Wuppertal on Sunday, trains appeared every 6-8 minutes and were well used by local people and tourists alike - there were a number of other people, mostly men, taking photographs of, and on the train. As it travels between 8-12 metres above the river and the streets, it provides good views of the town. The section I mostly travelled on, from the main station to the end at Vohwinkel, passes alongside the vast Bayer complex, which runs for the length of the Schwebebahn for three stations - at places on both sides of the river - where aspirin was first synthesised. Taking to the Schwebebahn for the first time, one is struck by the narrowness of the train, and how it moves. As it comes to a stop, especially after coming around a bend, the train rocks from side to side. There is a notice warning passengers about this, in German only. The trains comprise two carriages, joined in a flexible fashion as are many contemporary light trains. Inside there is room for two transverse seats in rows in the main sections of the carriages with an aisle along one side. 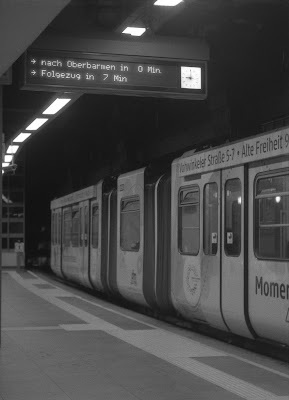 The aisle gives out onto the doors, which are on one side of the train only: station platforms are always on the right of the direction of travel, and the trains travel around a loop at the end of the line to return in the reverse direction. In Alice In The Cities, one does not quite get a sense of the narrowness of the carriages. As the trains always travel in the same directions, there is only a drivers' cab at the front: at the back of the train, there are three seats in a row underneath the rear window. As with the front of the Docklands Light Railway trains in London, these seats are very popular - especially with children.